San Diego’s marijuana permitting system is up and running, while South Bay communities Bay are still ironing out the details and taking vastly different approaches. In Chula Vista, the marijuana industry’s threats of forcing the issue onto the ballot have worked. After kicking and screaming, Chula Vista leaders are on the verge of creating a legal marijuana marketplace that in some ways goes beyond the one established in San Diego. 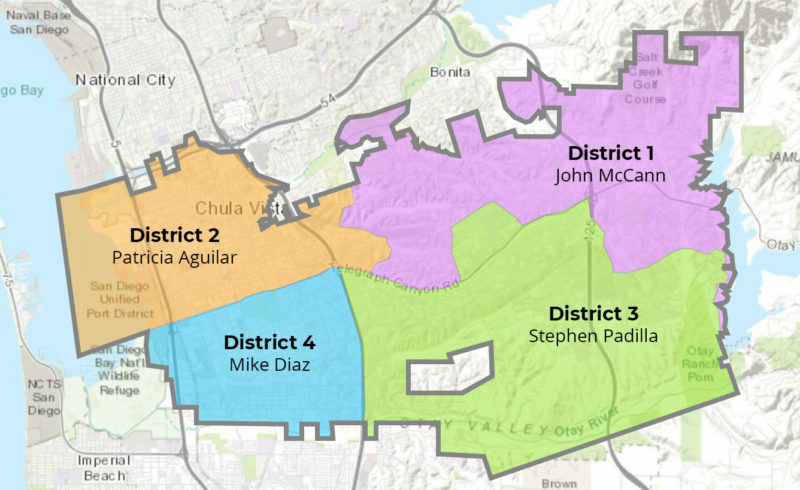 Officials in the largest South Bay community have drafted an ordinance that would allow for three retailers per each of the city’s four Council districts. Those licenses could go to either public storefronts or delivery services — a first for the region and a major victory for those in the industry who’ve lobbied for more options. The storefronts could sell recreationally while the deliverers could sell both medical and adult use products. No more than eight of the 12 retail licenses could go to storefronts. 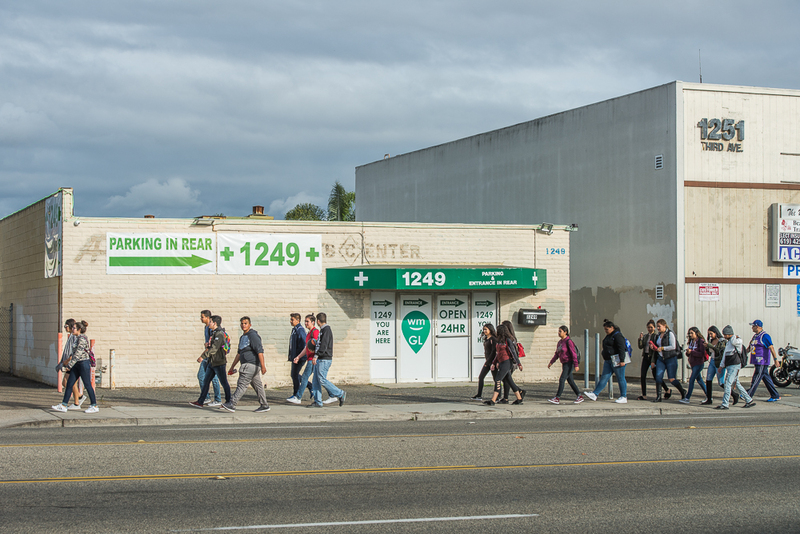 California’s licensing system launched on New Year’s Day and, since then, hundreds of independent drivers — who’d operated in a gray area of the law — have either joined a dispensary, ended operations or gone underground. In San Diego, the only city in the region with a medical and recreational marijuana licensing system, officials have prevented anyone except storefront dispensaries from making house-calls. There’s no guarantee Chula Vista’s draft ordinance, released in December, will stay that way when the Council meets again on Feb. 6. But Elizabeth Wilhelm, president of the San Diego Cannabis Delivery Alliance, is pleased officials are thinking of patients who can’t walk or drive to storefronts. If the ordinance stands, she said, it’ll be trumpeted around San Diego County as a model of smart regulations. “That’s something we can fly with and tell everybody else,” she said. Chula Vista’s ordinance is also unique in that it places no restrictions on the number of licenses awarded to the growers, manufacturers, distributors and testers that make up the local supply chain. It’s unclear whether zoning will be an obstacle for those businesses, as it has been in other places. But the proposed physical separations in Chula Vista are relatively less restrictive. For instance, storefront retailers would need to be 1,000 feet from day care centers and schools, and 600 feet from treatment facilities, parks and other “youth-oriented” entities. In San Diego, the distance is 1,000 for both categories — meaning some Council districts will see no marijuana outlets at all. Proposition 64, the state measure that legalized marijuana for recreational use, was approved in Chula Vista by about 52 percent of voters, but let municipalities opt out of legalization. Councilman Mike Diaz would be content to continue banning marijuana outlets, but he considered the alternative — an industry-backed ballot measure — much worse. The threat of an outside force that has a financial interest in the rules forced the city’s hand. He and other officials have held workshops, and took a trip late last year to Aurora, Co., to tour outlets and talk to cops and industry people, he said. Diaz is not crazy about the retail licenses going to delivery services, believing it creates an unnecessary risk of robbery. Instead, he’d prefer the manufacturing, cultivation and sales outlets be combined into a single, secured facility. That might bring down the cost of marijuana products and help challenge the black market, he said. For that same reason, he’s encouraging staff at City Hall to produce an economic impact report, so that the City Council can get the taxing structure right. Officials have estimated, according to the Union Tribune, that a five percent sales tax — on top the state’s 15 percent sales tax — would yield between $4 million and $5 million annually, money that could then be used to hire additional cops, code enforcers and administrators who can make sure the system is operating as it should. The Association of Cannabis Professionals is paying close attention. The industry group has drafted ballot proposals in parts of San Diego County where most voters supported Proposition 64 but where elected officials have been hesitant to open up the industry. Chula Vista has been high on its list, but the ordinance being shaped by officials echoes many of the group’s demands. “As long as all that stands, and they keep what they presented before, I think we’re pretty happy,” said executive director Dallin Young. He did, however, highlight one point of criticism. Storefronts in industrial zones would need to go through the conditional use permit, or CUP, process, while the other applicants would not. The CUP is longer and more expensive to get through, requiring more hearings and time for public review. The situation in Chula Vista contrasts with the rest of the South Bay. The opposition to marijuana is so strong in National City that leaders there banned adult-use dispensaries three weeks before California voters passed Proposition 64. There are no outward signs that attitudes towards either medical or recreational marijuana are softening. At a City Council meeting in October 2016, officials complained about the potential costs on law enforcement and expressed fears children would start using it. Assuming that other communities in the region would allow dispensaries, Mayor Ron Morrison encouraged National City residents to simply drive on down the road for their purchases. At the same time, Imperial Beach is working on its own ordinance, but it’s expected to be fairly restrictive because of the city’s limited commercial space. Officials released a map in December showing how few blocks are actually available — mostly those near California 75 and Palm Avenue. Imperial Beach had one of the highest percentages of Prop 64 “yes” votes in San Diego County. But the vast majority of residents who were surveyed last month said they were fine imposing limits on the number of businesses and keeping those businesses out of residential areas. A recent staff report recommended, at a minimum, setting aside two licenses for marijuana outlets, one of which is restricted to a single site that can cultivate, manufacture and sell on spot — what’s known in bureaucratic jargon as a “micro vertically integrated cottage” — capped at 15,000 square feet. The other permit could go to a retailer, a delivery service that works with a retailer, or a laboratory that tests products for distributors. Instead, the City Council asked at a meeting earlier this month that the two licenses be set aside for retail storefronts that could make home-deliveries. The two retail storefronts are not quite what the industry had in mind. Young said his group has enough signatures for a ballot proposal that would also give space to a marijuana lounge. But he’s withholding judgement until Imperial Beach officials release a draft of their possible ordinance next month. Nearly every one of the 70 residents surveyed at a workshop in December said they would prefer the ordinance, which could be tweaked in the future by the City Council. A ballot proposal could only be undone by another ballot proposal. Jesse Marx is associate editor at Voice of San Diego. He writes about San Diego’s pot industry and North County politics, and he manages the op-ed section. Contact him by email or through Twitter.